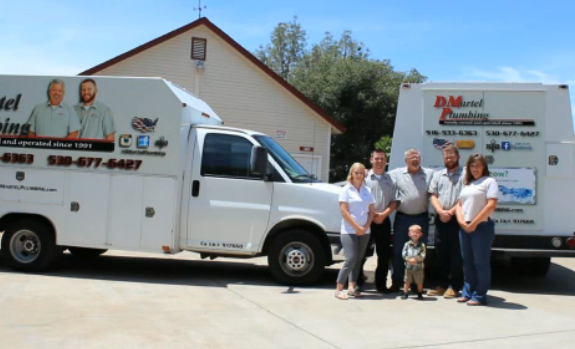 D. Martel Plumbing is a family owned and operated plumbing company that has been loyally serving our area since 1991. We started out managing new home plumbing construction from Tahoe to Sacramento, allowing us to know plumbing from the ground up. For over 25 years now, we have been the area's leading experts in all things plumbing, from plumbing repairs and plumbing service to replacements and plumbing installation and much much more. At D. Martel Plumbing, all of our technicians are background checked, drug screened and professionally trained to the highest standard... So you can share in our family's comfort knowing that every house is treated like a home with the utmost care and consideration no matter how big or small the job. Our technicians also work COMMISSION FREE to give you honest plumbing evaluations and recommendations without pushing expensive and unnecessary extras. While they may not all have the Martel last name, our plumbing technicians are treated like family and are held to the strict Martel standard.